Lovely home with plenty of room for adults and children. 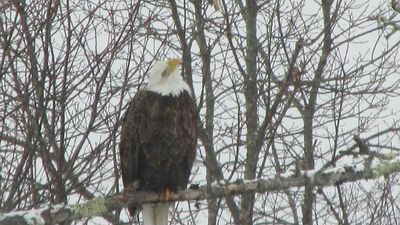 Just down the road from the marina for the ferry to Bar Harbor. The Island Explorer bus will pick you up right in front of the house. 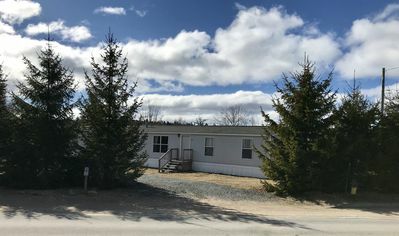 Within walking distance to shops and galleries downtown. Our location is quiet but has great access. 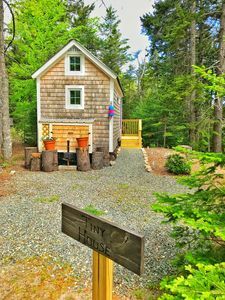 We are near all activities that the Schoodic/Acadia area offers. 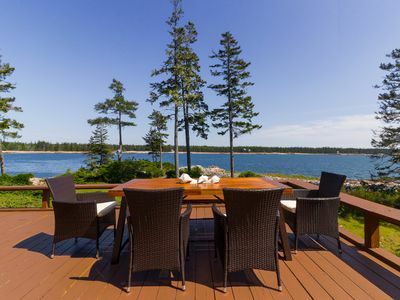 Perfect home base for your Downeast adventures. 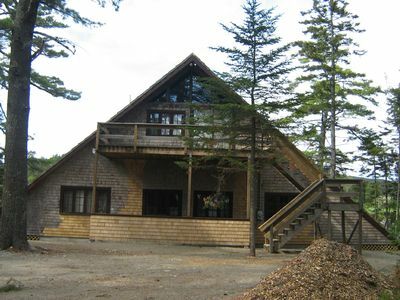 Our house is an upside down house with bedrooms on the first floor and dining, living and kitchen on the upper level. 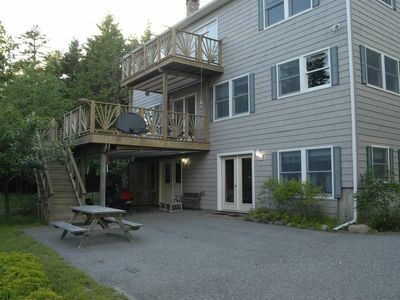 Upstairs is a large, open, bright space for gathering and enjoying lobster dinners. 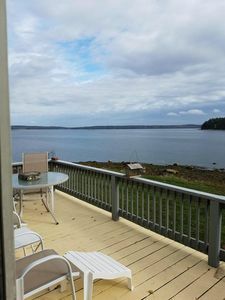 There are two sliding doors that open to a sunny deck with a view of the ocean. Two queen bedrooms, one double and one bedroom with a set of bunk beds and a full size bed. 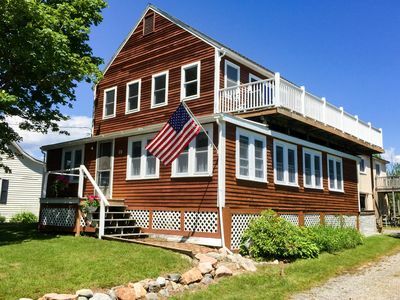 Located in the friendly and charming fishing village of Winter Harbor where you can find family-owned art galleries, shops and restaurants. Fresh live lobsters can be bought from the local lobster co-op. There is a golf course in town where the ocean can be viewed from all 9 holes. Schoodic Point, part of Acadia National Park, is a short car or bus ride away. Bring your bike and explore the many new bike trails in the park. Purchase homemade treats and locally grown produce at the farmer's market held every Tuesday. Excellent mackerel and squid fishing off the docks. 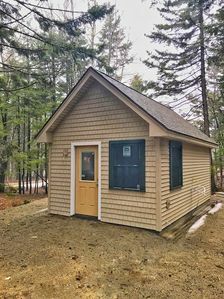 Our house is located on the Schoodic Peninsula near the Schoodic section of Acadia National park. It is a short (5 minute) drive to that area of the park which is less crowded than the main portion of the park. 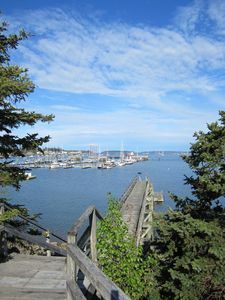 Some people prefer that but you should know that we are not right in the thick of the hustle and bustle of Bar Harbor. 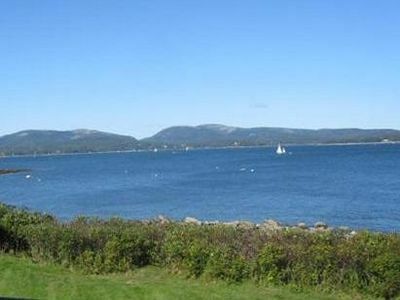 We are about a 50 minute drive from Bar Harbor and the main park which is on Mount Dessert Island. There is also a passenger ferry that leaves from the marine center right down the street from the house. It is a lovely scenic trip that takes about 45 minutes and there are various free shuttle buses over there to take you where you want to go in the park. 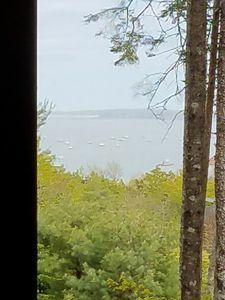 The great thing about the location of our house is that there is a free shuttle bus that goes right by the house every half hour so you can wave it down and take it to the Schoodic section of the park whenever you want. The bus has racks for bikes if you are interested in biking in the park. There are many biking/walking trails and the loop road is one way that has plenty of room for bikers and cars. There are binders and guidebooks at the house with even more details. We also have some bikes and kayaks available for guests to use. There are 4 restaurants in town all within walking distance of the house. There is a bakery right around the corner that serves wonderful pastries and other delicacies. 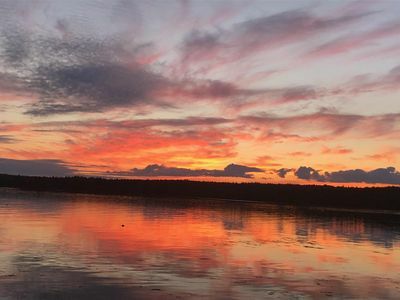 There is also the Pickled Wrinkle and Bunker's Wharf restaurant about 2 miles down the road in Birch Harbor. 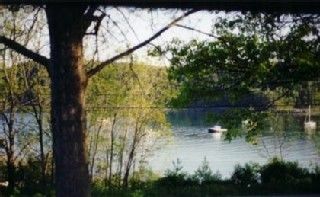 The Island Explorer bus route runs from late June through Columbus Day. The route passes right in front of the house and will stop for people there when it is flagged down. The bus completes a one hour loop through Schoodic point and nearby villages. The bus will take passengers and their bikes out to the park. 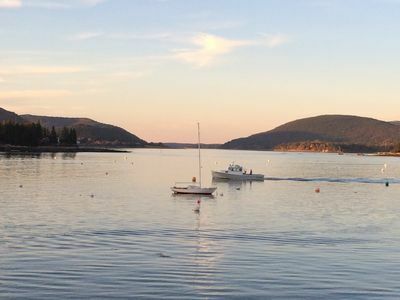 The ferry to Bar Harbor leaves from the marina down the street. Downtown is within walking distance of the house. There are many board games and puzzles available for guests to play and enjoy. 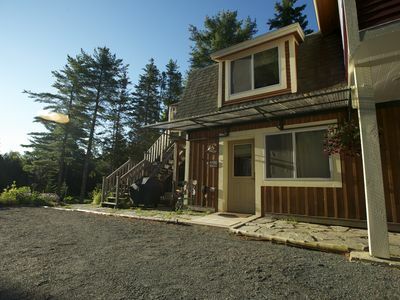 Charming, 2BR Oceanfront cottage with stunning views. Newly furnished. 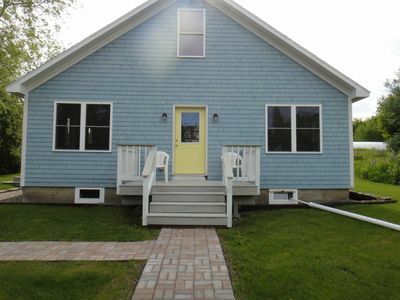 2 bedroom, 1 bath cottage completely renovated a year ago. 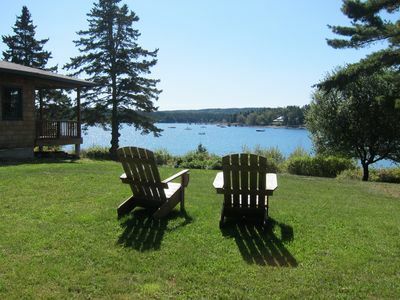 Walk to the harbor or pick up the Island Explorer bus in front of the cottage. 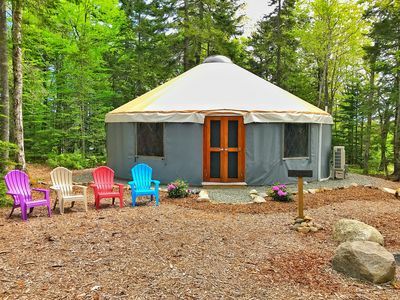 This is the perfect location for the budget traveler! 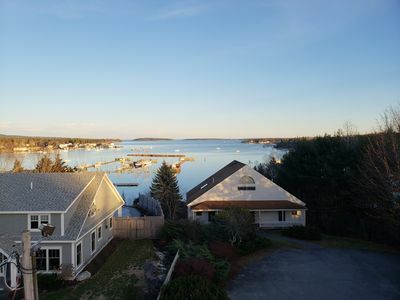 Beautiful waterfront home with spectacular ocean views – the perfect getaway! 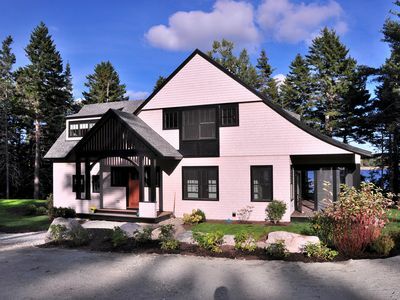 Architects cottage on the coast of Maine looking across at Acadia National Park.